BBQ season is officially upon us, but there’s a dramatic difference between flaming success and simply burning some burgers. 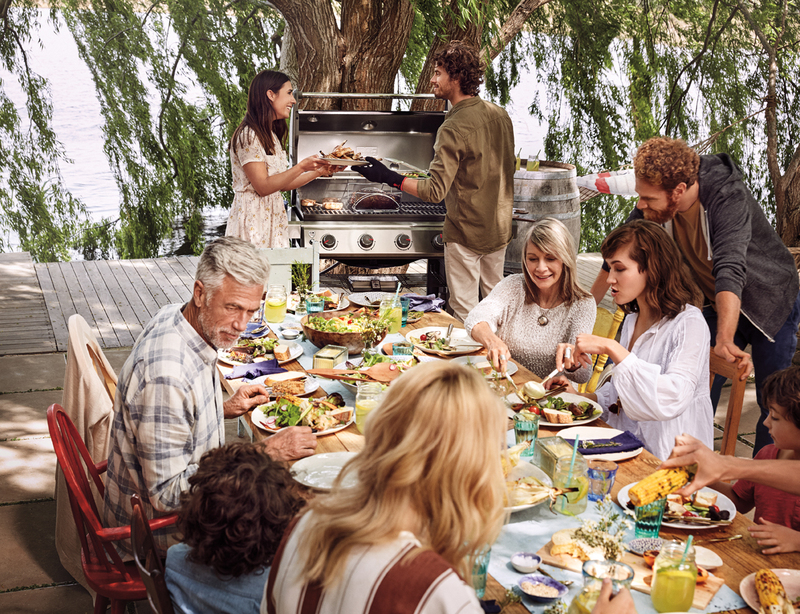 Which why, when we wanted to learn the secrets of good gourmet grilling, we teamed up with True Aussie Beef & Lamb and Weber, two experts in the field. Hosted by acclaimed master chef Tarek Ibrahim at Jumeirah’s Top Chef Studio, the event unveiled all the professional sourcing and cooking tips and tricks needed to take on even the truest Aussie in a battle of the BBQ. Your enthusiasm for cooking is always very clear when you host cookery sessions. Why do you love food so much? It’s my bread and butter. Cooking is not only a passion, it’s a way of life and I’ve lived it every day for 30 years. The industry is very exciting – things are always on the move and changing. There is so much variety, different cultures, inspirations and new ingredients. I especially like sharing knowledge with all types of people, and get a lot of satisfaction out of teaching young chefs and experienced chefs. I love that I have an impact on people’s lives. What drew you to hosting this event, and what is so special about Aussie Beef & Lamb? I enjoy sharing the qualities and attributes of Australian meat, especially with those who love food and cook at home. The origin of food is so important. Our producers in Australia take care of their animals in a beautiful natural environment, there are very high standards of hygiene and all Australian meat you buy here is halal. What are your favourite cuts of meat to work with, and why? When it comes to grilling, I love the Tomahawk steak. It consists of two different muscles – one is very sweet and the other is extremely tasty. You can’t go wrong with this cut and not only will it impress your guests, you can feed four or five people with just one piece. What are the key differences between gas and coal BBQing? Which do you prefer and why? The key difference is more about the ambience, the BBQ experience and convenience, than about taste. If you have grilled your food well, only very few people can taste the difference. Grilling with charcoal takes a bit longer to get started, and requires more technique in terms of heat control and timing. If you use a Weber gas grill and an iGrill3 digital thermometer, you are grilling in a matter of minutes and can control the temperature with precision. Much like cooking in an oven, but outdoors, surrounded by your family or friends. What makes Weber’s grill range stand out? Weber knows the grilling business very well; they’ve been producing grills for over 50 years. The high quality of the materials used means the cooking grates hold the heat. The grill design means you get the convection motion, as the heat circulates. I know I can rely on Weber grills for a great result. How did you set about creating the recipe published here? 1) Soak the wheat berries in cold water for around five hours. 2) Place the tomato paste, garlic, onions, chilli, saffron, smoked paprika, the lemon juice and most of the lemon zest into a food processor. Process for around 40 seconds, until well combined. 3) Heat the oil in a large deep-frying pan on your grill’s cooking grate or side-burner and sauté the chorizo and wheat berries for two to three minutes, stirring constantly. 4) Add the paste to the frying pan and cook, stirring, for two minutes. Gradually stir in the diced tomatoes and half the beef stock, and continue to stir as it comes to a simmer. Pour over the remaining stock, cover, reduce the heat and simmer for around 30 minutes, until the berries are tender. Remove from the heat. 5) When you are almost ready to eat, bring your steak to room temperature and then season generously with salt and pepper. Heat your grill to around 180°C and place the steak directly onto the grill. Close the lid and grill for around eight minutes, before turning the steak over. Grill for around eight minutes more, then set aside to rest for ten minutes. 6) Return your wheat berries to the heat and, once warmed through, add the spinach and most of the parsley and stir to wilt. 7) To serve, slice the rested steak and serve alongside the wheat berry pilaf, garnished with the remaining parsley and lemon zest. Some crusty bread and salad would go down a treat alongside. Weber grills are available in the UAE from Al-Futtaim Ace, Dubai Garden Centre, Speedex Tools and Prime Gourmet. True Aussie Beef & Lamb products are available from specialist butcher Prime Gourmet, and from all major supermarkets.